Over the weekend I read several articles from various sources that basically stated that the run in US Equities, commodities, gold and especially silver are essentially over and they have well outpaced inflation. Sure gold and silver are in corrective mode which is exactly what you want to see for a couple reasons. First, bull markets climb a wall of worry and lately there seems to be plenty of that going around. Second, corrections allow you to average in at a lower price, however, most people will not as Richard Russell says the bull market will work to carry along the least amount of people possible. 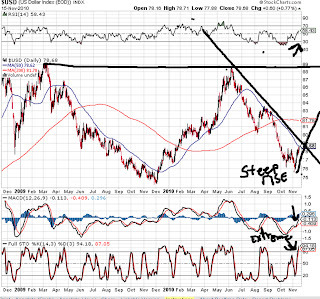 I don’t just believe that it is gold and silver that needed a breather, US equities in general and commodities all are extended and needed to come off and base for a while. What amazes me is that when you read or listen to the various people out there providing market analysis it never fails that they feel that the stock market is a predictor and it is always looking ahead regardless of what is going on presently. Several of the articles I saw made the case that the commodities markets have outpaced inflation and therefore are doomed to fall. It is interesting that if you look at the environment via the BLS’s CPI reports you can make a case that inflation is not keeping pace with the commodities market, however, if you look at it through the lens of the real world living or shadowstats.com then it is apparent that inflation is drastically understated and has been for a while. Moreover, just like the stock market, commodities are not reacting to the news of today but rather sniffing out inflation 6- 12 months out. While the precious metals markets do react to day to day news because they are both very small markets and directly influenced by the currency markets which have become the craps table du jour. For this reason it is not uncommon to see rapid rises and drops in the metals as the confidence in paper ebbs and flows particularly in terms of store of value. So at the moment we have some interesting things happening around the world. In Europe Ireland is following in Greece’s footsteps and acknowledged that its debt problems are getting worse. The Portuguese are voicing their concerns over the Irish condition as their economy has been affected by what the Prime Minister called the “contagion effect”. If you read the article you get the sense that there is a serious problem but no different than the Sub Prime mess here everyone is being told ”move along nothing to see here”, where have we heard that before. This instability has lead to a drop in the Euro and a converse rise in the Dollar. It is not that the Dollar is so much better a currency but rather because the DXY or Dollar index which is the measure of the Dollar against a basket of world currencies is up since the EURO comprises 40% of said basket. Now there are questions arising as to whether or not Ireland has just become a puppet of the EU due to its debt problems. The problem with the EU unlike the US is that there is history, nationalism and diverse economies all woven up in to the Euro and this causes friction and when push comes to shove human nature takes over. If you notice in the article the Portuguese are hoping that the Irish will do what is in the best interests of the EU and not Ireland; therein lays the problem for Europe. The US by contrast due to its melting pot nature has one national interest even though each area of the country maybe very economically and geographically different we still all think of ourselves as Americans first and not based upon our state at the highest level; meaning that while I may not reside or have been born in a particular state but if asked my nationality is American not ”New Yorker” or ” Bay Stater”. In Europe even with all the talk about the EU when the “marde” hits the fan the French, Germans, Spanish, Italians are loyal to their own countries first and the EU second. The remedy to this is that the EU out of Brussels will try to impose discipline and usurp the sovereignty of member nations in trouble, we will see how long that files. Just recently we saw how well the French handled part of the very tough austerity measures being imposed, yes I am being sarcastic, by protesting when the retirement age was raised by 2 years. The French were out in the streets rioting because of the increase, see it is ok to scold and punish the Irish or the Greeks but don’t touch my benefits that cost too much. It is for reasons just like this that when the “austerity” decisions get tougher I believe that the politicians all across Europe will do the time tested action, they too will join the FED and monetize so the people will get their benefits at a much reduced rate but they will get something. What will happen in France if they try to cut something of real significance? As if on cue, a juicy little tidbit comes out of Greece to prove my point that every country will do or try to do what is in their perceived best interests. The Greeks admit to breaching their bailout terms just as they are about to be audited. It is only a matter of time before the EU jumps on the QE bandwagon, and this does not even take into account the problems the UK is currently facing with their draconian cuts. Moving over the G20 debacle and I use that term kindly as it was an embarrassment to the nth degree and put the US in very weak and poor light in my opinion. Whether you voted for Obama or not is irrelevant at this point, we needed him and his administration to put in a good show at the G20. Instead we got one fantasy Asia trip that yielded supposedly a 10 billion dollars in Indian business deals that will supposedly create 50K US jobs, kind of like the 3 million jobs saved or created I suppose. During the G20 itself the US took several body blows and essentially walked away with nothing. Granted the position of the US has changed from day’s gone bye where we could dictate how things would be handled and the rest of the world followed suit, those days are long gone. The problem is that we have a ‘leadership gap” and the world knows it. Even under the Bush administration ,of which I was not a big fan, the US commanded more respect and could lead instead of being berated by China and others on the world stage. In the past it would have been the job of the Secretary of State and or Treasury to work in advance and come up with compromises that the “Leaders” summit could agree to; and if there was no agreement then expectations would have been downplayed unlike what happened this past week. Instead that did not happen and put our President in a position of weakness that neither the US nor the world can really tolerate at this juncture. In plain terms Obama was made to look like the weak wet behind the ears leader that he is and this is not good for any of us. In the end the upshot of the vaunted G20 meeting was a statement that basically holds no water and doesn’t address any of the current problems at least not in any manner that has teeth. So the current market thinking has been that since the President and his agenda have been rebuked in the Mid Term elections and now by the G20 that these outcomes are bullish for the Dollar. In the first place the feeling is that the Obama administration can no longer wreak havoc on the economy with their attack on the private sector and expansion of government. In some respects it is true that the worst of the Obama agenda is over or on hold, which is a plus. The flipside is that the Republicans do not have the power to overturn what has been implemented and both sides have very different views on where to cut if they can even come to a compromise. So I predict that there will be no real budget cutting and the size of the government will probably stay in the current range . The G20 was a further rejection of US policy and some feel that the FED will back off of its current path due to pressure from the world, which would be bullish for the dollar. The notion that the FED would change course is ludicrous as the mission of the FED is to protect the banks and government and the only way to do that is to inflate away the debt, it is not like we addressed this issue 10 years ago when it was first starting and now “the US government has become the ultimate too big to fail”. The world knows and the FED fully understands that failure is not an option and allowing the dollar to rise would have a perverse outcome not only for the US but also many of our trading partners. Ironically, the Chinese are the ones most vocal about the Fed policies, but they are caught in a tricky spot as they don’t want the Yuan to appreciate and they want to stem capital inflow due only to the FED’s QE2. The Chinese implemented a rise in the reserve ratio, which is the amount of capital a bank has to keep on hand, that should help to contain some of the money from flowing in to the economy. Additionally, the Chinese have stated that they would conduct their own open market operations to combat the FED’s QE and they also are using capital controls limiting real estate purchases by foreigners to for the same reason. The Chinese face a choice of either allowing the Yuan to revalue which would end their inflation problem or they need to institute controls to deflect the “hot” money looking for better returns. If they let the Yuan rise then their products get more expensive in other markets and presumably their volume of sales would decline, where as if they can keep the peg on the Yuan the costs for consumers will stay in a more acceptable range and the volume will remain more or less level but would stoke domestic inflation. This is China’s Achilles heel, since they still do not have a sufficient internal market to not care about what happens elsewhere on the globe, unlike say the US of the last century. Today Joesph Stiglitz, the economist, came out urging emerging economies to put in to place capital controls due to the in rushing liquidity as as result of QE2. Stiglitz, is concerned that countries like India do not have a method for dealing with the influx of capital and worries about inflationary pressures there, where as Brazil and China have an idea as to how to handle such a problem. If countries around the world follow Stiglitz’s advice then capital would be limited or shut out of many markets which could do two things. First it could cause various countries around the world to be starved for capital and hurt their export markets as their currencies would rise against the Dollar. Second without the relief valves of foreign markets Bernanke’s QE would find a home here and ignite the inflation that he seeks. Of course this inflation could run very hot and very quick to the upside which would be very Dollar bearish. It appears as if the Korean’s are not heeding Stiglitz’s advice and they are planning to hike rates .25% tomorrow too to cool off inflation in their economy; although without capital controls this will just serve to draw in more Dollars chasing some yield. Lastly there is talk about the proposals put forth by the National Commission on Fiscal Responsibility and Reform, a bipartisan commission that Obama commissioned. The proposals coming out of the panel purportedly will save $4 Trillion from 2010 -2020. Included in the proposal are discretionally spending cuts such as :Federal pay freezes, cutting the size of the federal workforce, reducing costs inside the department of defense, reducing foreign aid, earmarks and scaling back military bases. Then there are the reductions to Social Security, Medicare, Medicaid and a plethora of other programs and agencies. Furthermore, there is the idea to close various tax breaks like the mortgage deduction and imposing completely different tax brackets across the spectrum. So the idea is to lower but broaden taxes, cut waste and entitlements to reduce spending, seems like a no brainer to me. Upon the release of the details of this plan we became “Europe”. Everybody is all for fixing the problems as long as you don’t touch our portion or entitlements. Virtually as soon as the information hit the press and was announced the special interests got to work and began to go after their own specific area that is affected. The bottom line is that there is no way that we are going to come to a consensus on this as a country and our “leaders” are far too concerned with getting reelected and rather than jeopardizing that prospect to do the right thing they will just kick the can down the road. The Tea Party and their candidates campaigned on the notion of controlling spending and deficits, but I will wager that when push comes to shove they won’t back things that adversely impact their constituents. I draw the conclusion that while I believe the game that Bernanke is playing is dangerous and inflationary a determined FED will win the day. It does not matter how much the world belly aches their actions demonstrate that nobody is willing to cooperate or sacrifice for the world good. Instead human nature is going to win out as usual and it will be every country for itself monetarily. The US will not default and they continue to print and send mixed messages so the rest of the world will do what they need in order to protect their interests. Obama, Geihtner and Bernanke want to have their cake and eat it too, but the world wants its slice. If you combine all the messages from the three main players it should be obvious that we want a weak dollar, strong dollar, export, and non export economy. Is it any wonder why it is every country for itself? So while I do believe that the Dollar is getting respite I am not buying the argument that this is a new trend but instead a relief rally and will peter out shortly. I believe that the Dollar Horse is pretty tired and after this knee jerk reaction people will again begin the process of getting out of Dollars while the getting is good. Is it coincidence that on this past Friday that when everything stocks to commodities was down so was the Dollar which would have normally been the beneficiary of such a day; this suggests to me that investors and traders are questioning whether the Dollar deserves their confidence. As for the fall in everything it indicates a general confusion in the markets due to the effect of the “Chinese rate hike” announced and the fact that everything has been rising for weeks and needed a break. 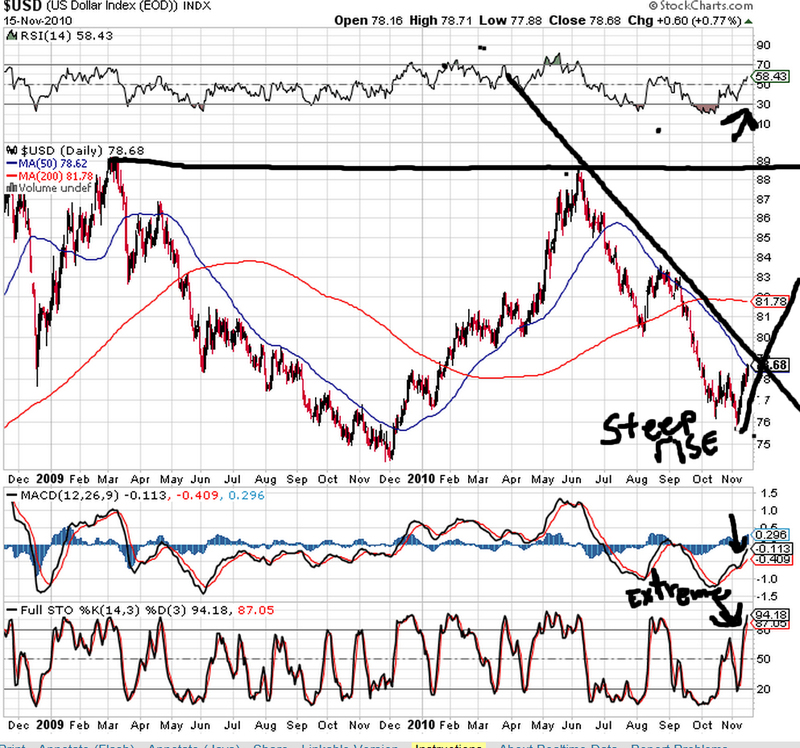 Time will tell but I believe the Dollar is running in to severe resistance due to lousy fundamentals and techincals. If the Dollar can overcome resistance here at the 50 Day moving average at 78.69 it could rally to test the 200 day at 81.78 which is more formidable; however the angle of ascent is quite parabolic and the relative strength is weak while the Stochastics are signaling everyone’s favorite “overbought” as well. 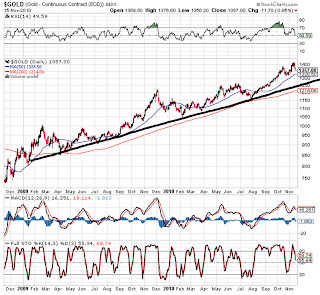 The flipside is assuming the inverse correlation of gold to the dollar it could test all the way down to the $1300 level before resuming its upward march along with the commodities and equities markets. 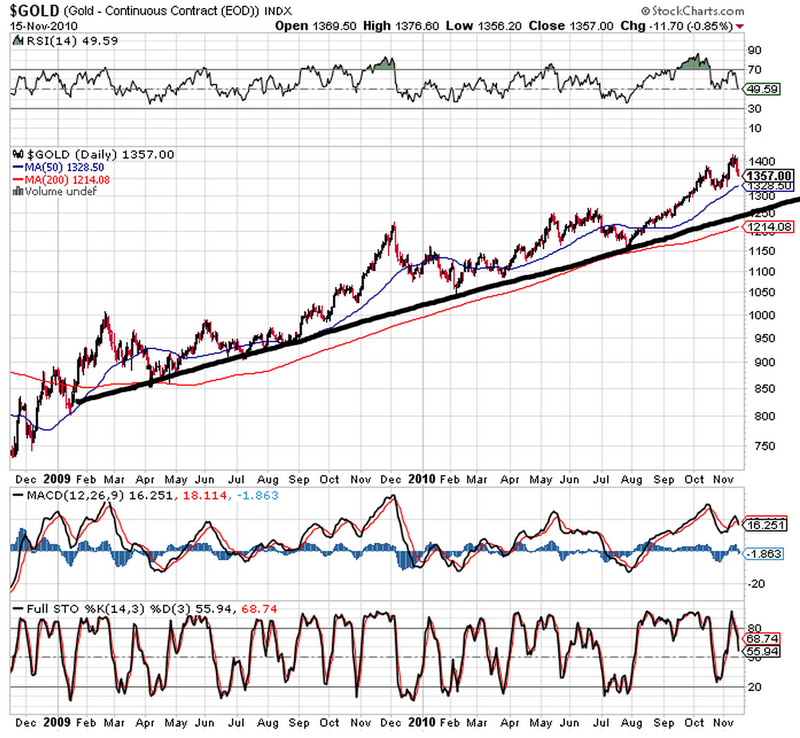 Gold is not yet oversold although that does not mean it has to go down to oversold especially in a bull market. Furthermore, the 50 day moving average is still below at $1328 and trend line support is all the way down at $1250. Let’s hope we don’t need to test trend line support, but even if it was tested the uptrend would still be intact, but progress upward would take longer. The equities and commodities markets should resume their upward path shortly in my estimation. 11/15/10 (TheStreet) — Soros Fund Management, the fund management arm of billionaire investor George Soros, bulked up on health care and biotechnology in the third quarter, according to the hedge fund manager’s quarterly filing of portfolio holdings, released after the market close on Monday. At the same time, the famed hedge fund manager notably shifted away from gold, one of his favorite investments. Barrick Gold and Newmont Mining were also among the Top 10 position decreases for Soros in the past quarter. Soros also entirely sold off stakes in three mining companies: Ivanhoe Mines, Golden Star Resources and Gold Fields. Soros also sold out of some other notable stocks in the third quarter outside the mining sector. November 15, 2010 (MarketWatch) — Soros Fund Management LLC, headed by George Soros, increased gold positions during the third quarter, according to a regulatory filing late Monday. Soros held 4,697,008 shares of the SPDR Gold Trust and 705,000 call options on the gold ETF at the end of September, the filing showed. Soros also owned 5,000,000 shares of the iShares Gold Trust at the end of the third quarter, according to the filing. Three months earlier, Soros held 5,244,697 shares of the SPDR Gold Trust, a portion of which was a shared position. The firm held no shares of the iShares Gold Trust at the end of June, according to the filing. Such regulatory filings don’t include all positions held by investment firms. Many derivatives, direct commodity holdings and short positions aren’t included. It is obvious no one really knows what is going on anymore!